While water can deal significant damage to a building, the worst of the damage is often not caused directly by the flooding itself. Call us for a mold remediation quote today! We serve Toms River, Woodbridge, Cherry Hill and many nearby areas, including Princeton Junction, Bridgewater, Old Bridge, Middletown, Lakewood, Piscataway, New Brunswick and other parts of New Jersey. High humidity contributes not only to discomfort at any temperature but it a major cause of moisture in an indoor environment. And that moisture can lead to mold. Dehumidifiers keep your relative humidity levels down, making spaces comfortable and maintaining an environment not conducive to mold growth. Mold Solution by Cowleys offers the highest quality, professional grade “Energy Star Rated” dehumidifiers available today. Based on your particular indoor environment, we will choose and install the dehumidifier best designed to meet your needs. 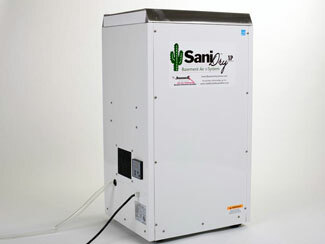 We install, service and use the SaniDry™ Sedona and the SaniDry™ XP dehumidifier and air filtration systems. Venting bathrooms, dryers, and other moisture-generating sources to the outside will help reduce moisture and humidity. Liquid water evaporates into vapor, which is invisible. The relative humidity (RH) of air, expressed as a percent, is a measure of how much water vapor is in the air as compared to the total vapor that could be in that air (what it could conceivably hold). As the temperature of air increases, the air’s capacity to hold water increases as well. The temperature at which the RH is 100% is called the dew point. The dew point is where the air can hold no more water vapor; it’s the temperature at which moisture will condense from the air. So, if the temperature is at its dew point and more water vapor is introduced, vapor condenses – changes from vapor to liquid – on any surfaces cooler than the temperature. An elevated RH of 70% or more at a surface can lead to problems with mold, corrosion, decay and other moisture-related deterioration. 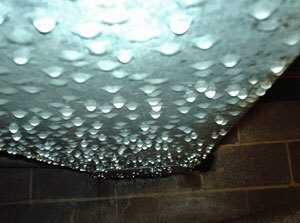 When RH reaches 100%, condensation can occur on surfaces leading to a whole host of additional problems. An elevated RH in carpets and within fabrics can lead to dust mite infestation and mildew (mold growing on fabrics). Mold grows on surface dust or wallpaper on cooler walls in rooms and closets when there is high RH and on bathroom walls and ceilings as a result of condensation. The EPA recommends reducing indoor humidity to 30-60% to decrease mold growth. 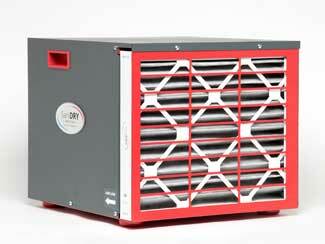 For a free written humidity control & drying quote in your area, call or e-mail us today! We provide services to structures of all types -- commercial, municipal, and residential -- throughout Woodbridge, Toms River, Cherry Hill, Bridgewater, Princeton Junction, Middletown, Old Bridge, Piscataway, New Brunswick, Lakewood, and nearby areas.